Find out how the World's smallest Micro Four Thirds camera, the Panasonic Lumix GM1 performs in our full review. 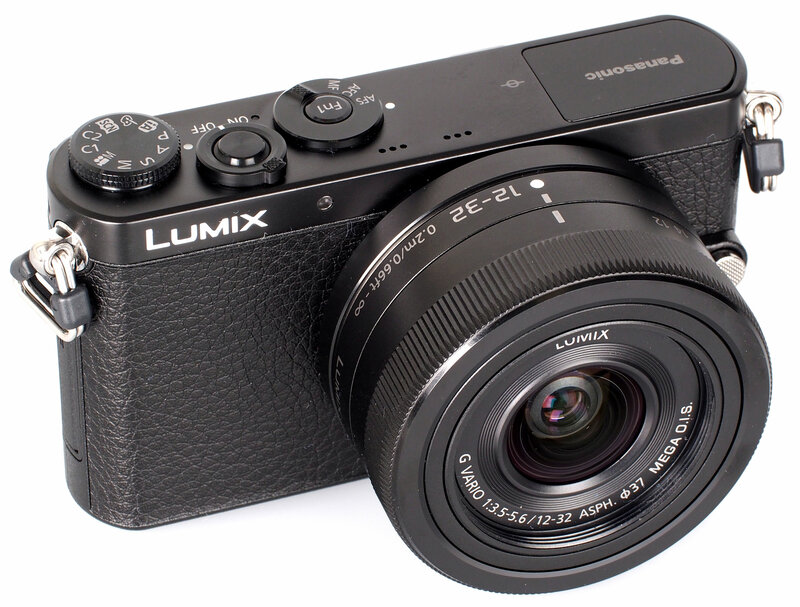 The Panasonic Lumix GM1 is the smallest Micro Four Thirds camera available. It has an ultra-compact magnesium alloy body that weighs only 204g and measures just 98.5 x 54.9 x 30.4mm. In order to give the smallest camera possible, it is introduced with a new, ultra-compact 12-32mm f/3.5-5.6 Mega OIS lens, specifically designed for the GM1. The camera features a 16 megapixel Micro Four Thirds sensor, ISO125 - 25600, a 3inch 1036k dot touch screen on the back, as well as a mode dial on the top which includes automatic, scene, manual and video modes. 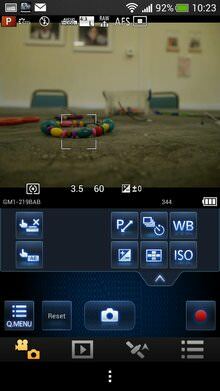 The touch screen can be used for selecting the focus point and the camera features focus peaking. It features a built in pop-up flash, something other compact Micro Four Thirds cameras have lacked, and instead used an add-on flash, such as the Olympus PEN Mini E-PM2. The camera records full HD video, as 60i/50i/24p with stereo sound, and gives full manual control. Continuous shooting is at 5fps at full resolution using the mechanical shutter, and the camera can use either the electronic or mechanical shutter, with a shutter speed as fast at 1/16000th of a second. The ultra-compact body has been introduced with a new ultra-compact 12-32mm f/3.5-5.6 collapsing pancake zoom lens with built in Mega Optical Image Stabilisation, equivalent to 24-64mm in 35mm terms, giving the lens a 2.66x optical zoom. 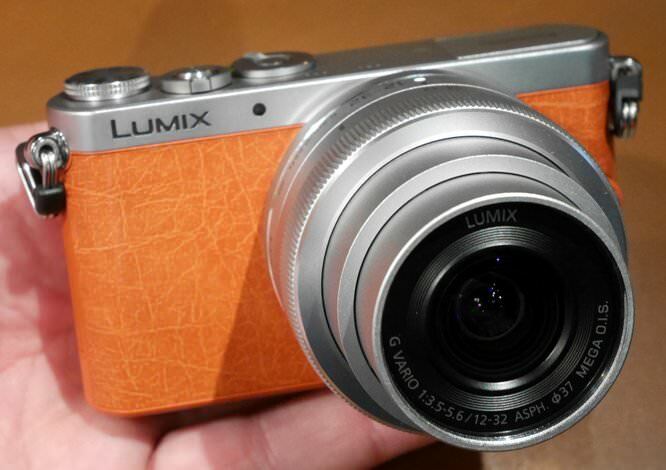 There will also be further Panasonic and Leica lenses specifically designed with the Panasonic Lumix GM1 in mind. Built in Wi-Fi allows the camera to be controlled from a compatible Android or iOS smartphone or tablet, using the smartphone as a remote shutter. Alternatively images can be transferred to the smartphone, and it's also possible to setup automatic backup to PC via your home Wi-Fi router. The camera features a 22 digital effects, as well as time-lapse, stop motion animation, and clear retouch. 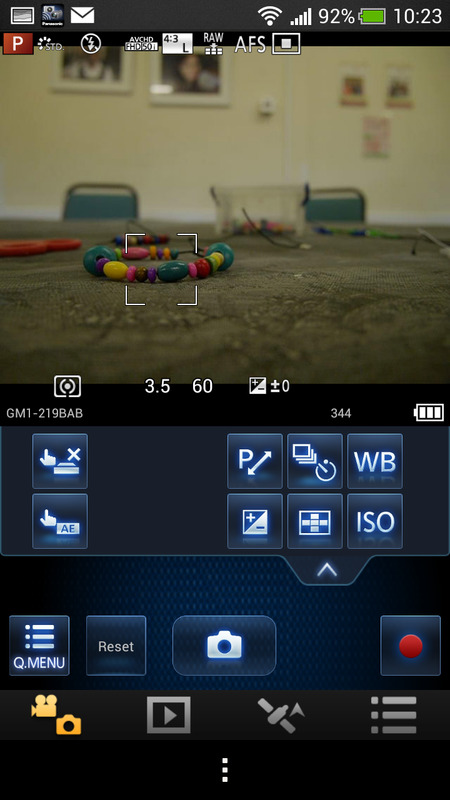 Handheld HDR and Handheld night shot modes have been improved and there are a total of 23 scene modes. Colour filters have been added to the black and white modes. The camera is impressively compact, smaller than the Pentax Q which features a much smaller compact camera sensor - a picture showing the size difference between the APS-C, Micro Four Thirds, and compact camera sensor can be found here. The top features the mode dial, on/off button, fn1 button (doubles as the Wi-Fi button) and manual focus switch which lets you switch between AF-S, AF-C, and MF. The compact pop-up flash is found on the left, as there is also a marking for the sensor plane. The back features a small button to pop-up the flash, the touch screen, and video / playback, Q. menu, display and 4-way scroll wheel, with middle menu/set button. There is also a small textured area for your thumb, and the front of the camera is covered in a textured leather style coating. The screen is clear, and the logically laid out Panasonic menus are easy to navigate using either the touch screen or the direction control pad on the rear. The screen is gapless which helps with being able to see the screen when used outdoors. The new 12-32mm ASPH. f/3.5-5.6 pancake zoom lens is collapsible like the Olympus 14-42mm kit lenses, and is the equivalent of 24mm wide angle to 64mm telephoto (giving a 2.66x optical zoom), with the closest focus distance for the lens being 20cm. Mega optical image stabilisation helps ensure sharp shots in low light. When compacted the lens is smaller than the Panasonic 20mm f/1.7 lens being shorter as well as having a smaller diameter. The optional handgrip adds a textured aluminium grip and screws into the bottom using the tripod socket. It adds little to the height of the camera, but makes the camera much more comfortable to hold, otherwise we would recommend the use of a wrist or neck strap. The feel of the camera differs slightly depending on the colour option you go for, with the orange and silver camera featuring a leather like finish, and the black camera featuring a slightly more standard camera finish. 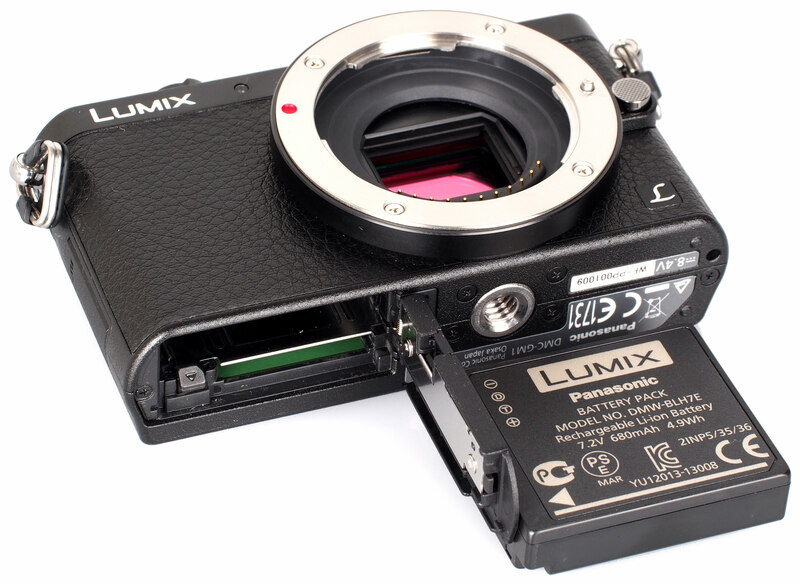 The silent shutter enables completely silent shooting (electronic shutter), and the shutter unit is said to be 80% smaller than previous shutter units, by using a stepping motor rather than a spring. The built in Wi-Fi connectivity lets you remotely control the camera using the Panasonic Image App on a smartphone or tablet, and is available for iOS and Android devices. There are a large number of options and settings that can be accessed and changed, making the app extremely useful, there are also time-lapse options, and you can view and share images, as well as tag photos with GPS information. Battery life - Battery life is rated at 230 shots according to Panasonic / CIPA test results, we were able to take just over 220 shots before the battery went flat, and would recommend investing in a second battery if you need it. Panasonic Lumix GM1 next to the Panasonic Lumix G6 - both feature the same size Micro Four Thirds sensor. Shown below, is the Panasonic Lumix GM1, next to the Nikon 1 S1, which has a smaller 1inch sensor. Nikon 1 S1 Vs Panasonic Lumix GM1 size comparison. The camera can shoot at 5fps with mechanical (electronic front curtain) shutter, or 10fps with electronic shutter at full resolution. 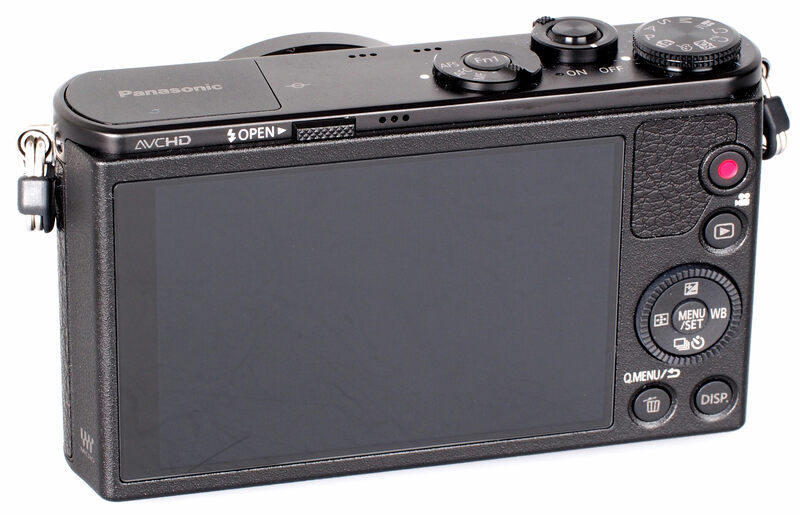 Focus is very quick, as is the norm for Panasonic (and Olympus) Micro Four Thirds cameras, and the focus can be set quickly using the touch screen. The camera features 23 focus points, so as long as the area you want to focus in within this area you can simply touch the screen and focus. Focus peaking is included and you can select the colour of the outline. Sample Photos - Flash photos are free of red-eye and portraits have good skin tones, with the camera taking a photo with very good detail. Exposure is very reliable, with the camera performing well in a variety of shooting conditions. Using Micro Four Thirds lenses means there are a number of bright aperture lenses available, such as the Leica 25mm f/1.4 or Voigtlander 42.5mm f/0.95, just to mention a few which performs extremely well in low-light and give pleasing bokeh. Lens Performance - The compact 12-32mm lens performs well capable of recording high levels of detail, even into the corners of the image when shooting wide-angle or with zoom. There is a slight hint of vignetting in the corners, which can be corrected in camera by switching on shading compensation, and purple fringing and chromatic aberrations are very low with the camera automatically correcting for these problems. Barrel distortion is noticeable when shooting wide, however pincushion distortion appears low when shooting at the telephoto end of the lens. Macro performance of the kit lens is a weakness, with the closest focusing distance shown above at the telephoto end of the lens, and for any more serious macro photography a different lens is recommended. When shooting with the sun in the frame it is possible to see some lens flare, as shown below, however this wasn't a huge issue the majority of the time. ISO Noise Performance - The ISO range goes from ISO200 to ISO25600, and the lowest ISO setting can be extended to ISO125. Noise is low at ISO125, ISO200, ISO400 and ISO800, with a slight increase in noise at ISO1600. At ISO3200 there is a slight, but noticeable loss in detail, however results are still good. Noise performance at ISO6400 is still good, although the effects of noise reduction are easy to see, with detail degraded further. 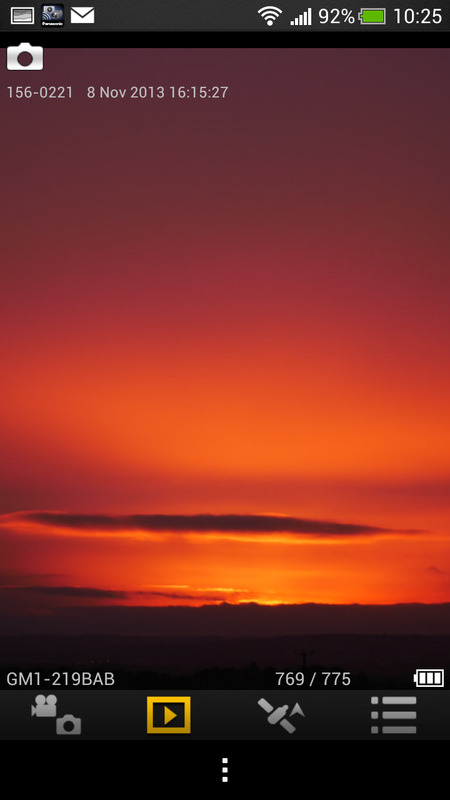 At ISO12800 and above, the effects of the electronic shutter can be seen, with banding visible in the image, and due to noise levels these last two ISO setting may be best avoided. White Balance Performance - Auto White Balance (AWB) performs well under tungsten lighting although there is a slight yellow colour cast, with the tungsten preset delivering a more accurate result. 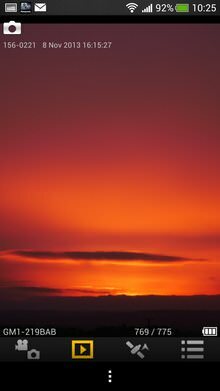 AWB performs well under fluorescent lighting, which is a good job, as there are no dedicated fluorescent lighting preset modes available. The camera has a number of features for expanding dynamic range recorded if needed, including iDynamic, as well as HDR that combines 3 shots at different exposures. 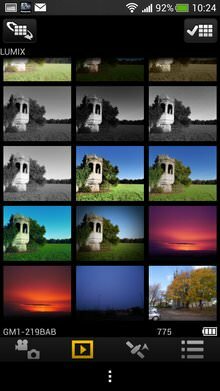 Digital Filters - The GM1 has a total of 22 Creative Effects, with a number of additional black and white modes such as rough mono, and silky mono, that give the option of applying a black and white filter, such as Green, Red, Blue etc, to give the same effect as shooting black and white film with a filter attached. The camera records both the JPEG and raw file so you can go back to the original image if you don't like the effect. The camera includes a sunshine mode which lets you position an additional light source in the image as well as alter the size. Video - The camera records full HD video at 50i, 25p and 24p, with stereo sound and the highest ISO setting is ISO3200. Quality is good, and the built in optical image stabilisation does a good job steadying handheld videos. The Panasonic Lumix GM1 is available for around £629 with 12-32mm kit lens which makes it good value for money, although it is at the pricier end of the market, priced similarly to the following premium compact cameras, however with the ability to change lenses. If you don't need something so small, then other mirrorless cameras offer better value for money. 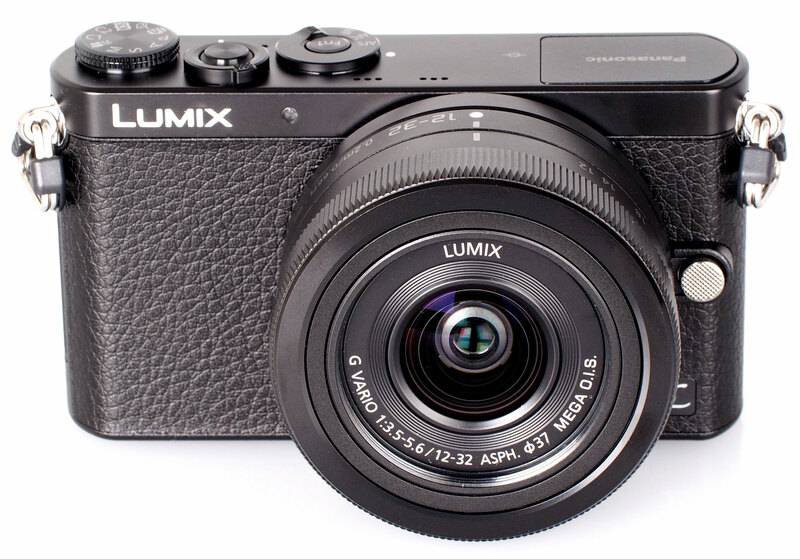 The Panasonic Lumix GM1 price is £629 with 12-32mm kit lens, which makes it quite expensive for a mirrorless camera, and it's designed to compete with other premium compact cameras, such as the Sony Cyber-shot RX100 II, with 1inch sensor, although benefits from a larger Micro Four Thirds sensor, and the option to change lenses. 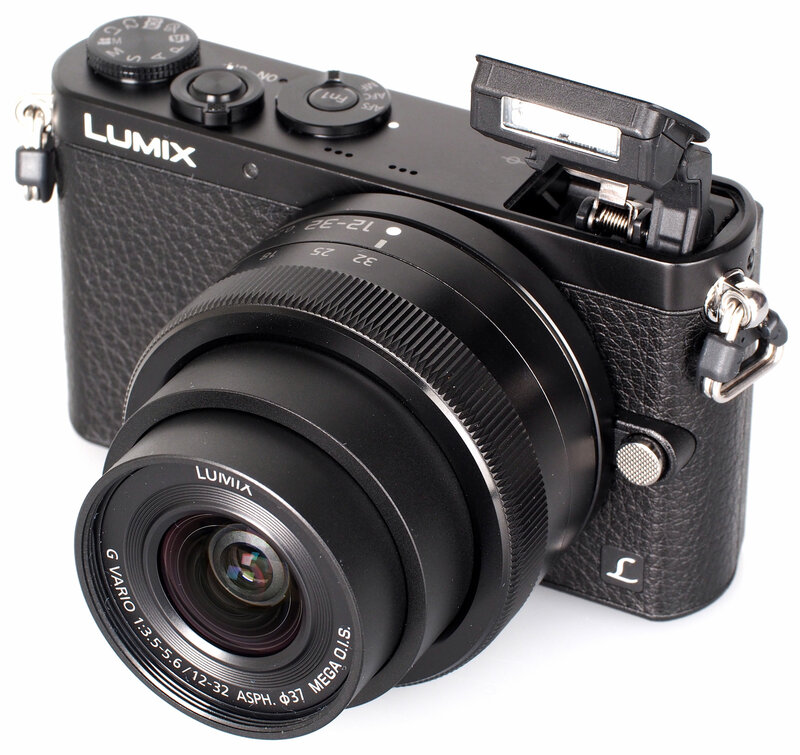 The Panasonic Lumix GM1 offers all of the advantages of a compact system camera, including access to one of the largest ranges of lenses for mirrorless cameras, from Panasonic, Olympus and others. Despite being the smallest Micro Four Thirds camera, and also being smaller than other mirrorless cameras, the Panasonic Lumix GM1 doesn't compromise on image quality or features, and delivers advanced features and options in a camera small enough to fit in your pocket even with the lens attached! 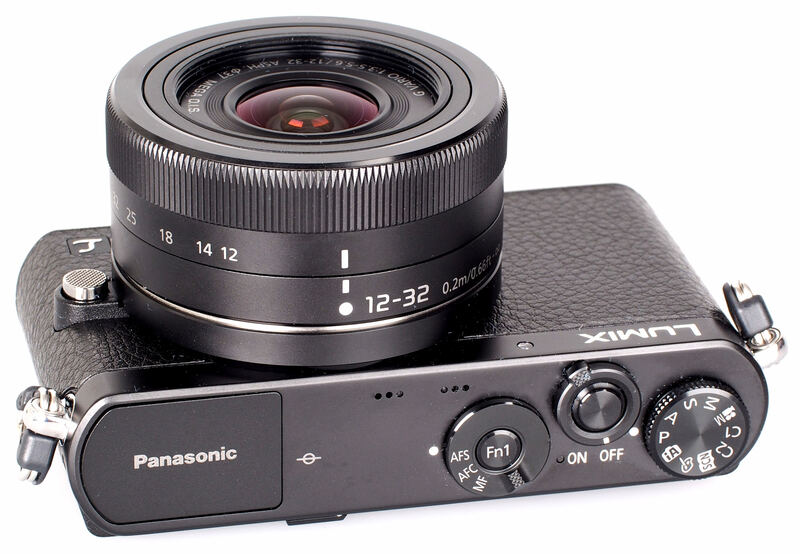 The camera has a good 3 inch touch screen which makes it easy to use in combination with Panasonic's clear and logical menu system and built in Wi-Fi makes sharing photos or using the camera remotely easy and fun. 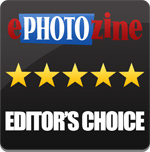 There are a few negatives, including the short battery life, and the kit lens doesn't offer as good macro performance as other kit lenses available, but for those that want excellent image quality, the ability to change lenses, and the smallest compact system camera possible, the Panasonic Lumix GM1 is our Editor's Choice! 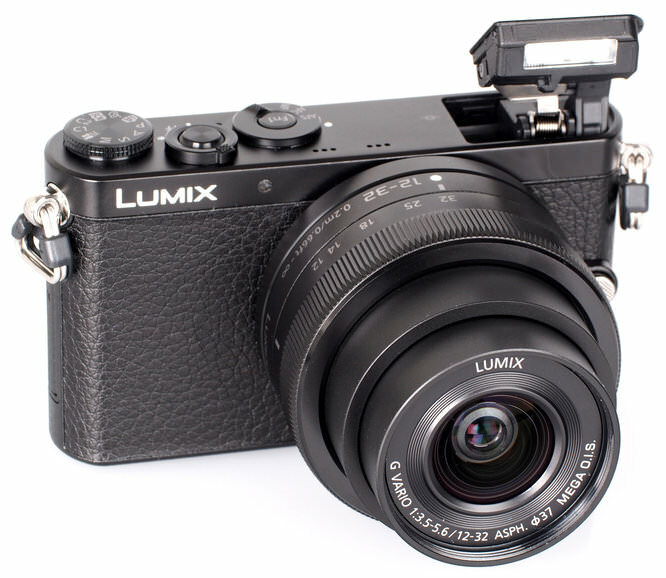 The Panasonic Lumix GM1 is a miniature marvel, showing just how compact the Micro Four Thirds system can be without compromising on image quality! Are those genuinely ISO 3200 samples? Even sampled down to 5mp they look [i]too[/i] clean - and detailed [ie not just processed and smeared] at that. I'm a always a little suspicious of something that looks too good to be true. This could be the ultimate pocket/stealth camera. Can I afford [i]another[/i] £650? Seriously tempting. Are those genuinely ISO 3200 samples? Even sampled down to 5mp they look too clean - and detailed [ie not just processed and smeared] at that. I'm a always a little suspicious of something that looks too good to be true. This could be the ultimate pocket/stealth camera. Can I afford another £650? Seriously tempting. Quote:Are those genuinely ISO 3200 samples? Even sampled down to 5mp they look too clean - and detailed [ie not just processed and smeared] at that. I'm a always a little suspicious of something that looks too good to be true. This could be the ultimate pocket/stealth camera. Thanks Josh - somehow the GX7 image at ISO 3200 didn't look quite as impressive, but it's probably the subject on revisiting the equipment database - there doesn't look like a lot of visible noise at ISO3200. Very impressive. We've added full size ISO and WB test images. Thanks for the review! Looks like a great, little camera, especially with the 20/1.7 mounted. Any chance there is a minimum shutter speed for auto ISO? Thanks for the review! Looks like a great, little camera, especially with the 20/1.7 mounted. Any chance there is a minimum shutter speed for auto ISO? How does one use the kit zoom in manual focus mode? I can't see a focus ring on the lens. The problem with lack of viewfinder, often pointed out, is easily solved using a rubber loupe. They can be found cheaply on internet. I have yet to see a reviewer suggest this simple and adequate solution. It is also possible to keep your eye close to the screen when the sun is too strong. You get the added support and you can see the composition albeit blurry, but if you also keep your other eye open you can determine the critical moment to press the shutter. Sounds mad but works fine. Another low cost solution to an often perceived problem.